The 2014 Equestrian Festival was held at the Marsa Racetrack yesterday. This year this festival included a show jumping activity, a dressage demonstration, a polo game and a number of pony races. It was organised in collaboration with the Malta Sports Council, the Malta Polo Club and the Malta Equestrian Federation and ended with six trotting finals held on a mile distance. 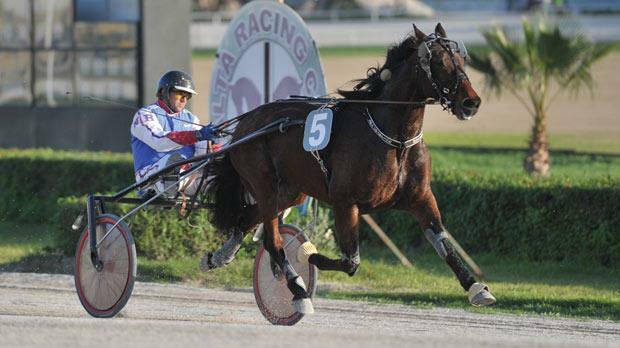 The major final, reserved for class Premier trotters, was won by Swedish B.W.L. Champion, driven by Noel Baldacchino. Nine horses took part in the class Premier final. A keen tussle between five trotters developed in the final straight of this major race. It was B.W.L. Champion (Noel Baldacchino) which had to go all the way in the final 100 metres and eventually succeeded to register its first win in Malta by two lenghts and a half from Pactole De L’Iton (Michael Ellul) and Made In Hoff (Jesmar Gafà). Over Oaks (Carl Caruana) followed behind in fourth place. At the end of this final, Parliamentary Secretary for Sport Chris Agius presented a memento to Baldacchino and Angelo Bonello, the driver and owner respectively of the winning horse. B.W.L. Champion managed to clock an excellent average time of 1.14.1” per kilometre. The other finals were open for class Gold, Silver, Bronze and Copper trotters. After leading all the way, Quito De Femisson (Kirsten Gialanzè) notched its second win in a row in the class Gold final. Sigurd Speed (Mark Tanti), Skip Dimanche (Victor Grech) and Mission Di Poggio (Charles Camilleri) followed home in that order. In the class Silver A final, Starfirefinnfemfel (Julian Farrugia) ran out of steam midway through the final straight and was overtaken by Pepita Ans (Rodney Gatt). This Italian mare sealed its second win in a row from Quo De Clerlande (Charles Camilleri) and Razor Shadow (Nathaniel Barbara). Grace Party (Noel Baldacchino) confirmed that it is one of the most consistent horses of the season. In the class Silver B final, this Swedish mare dashed strongly from the outside 600m from the end and took its seventh win of the year by two lengths from Magnific As (David Ellul), Cross Country FC (Daniel Hili) and Quoro D’Isques (Eric Bezzina). In the class Bronze final, Janitor (Marvin Cauchi) surrendered the lead to favourite Querido Censerie (Julian Farrugia) only few metres from the post. For the latter this was its third win of the year. Britt Buitenzorg (Rodney Gatt) bagged its second consecutive win in Malta in the class Copper final. The Dutch six-year-old mare triumphed in this final after surging clear off the field 400m from the end. Another special meeting at the Marsa Racetrack will be held on Sunday. This will consist of ten races all for trotters and will include the VOB Grand Final for class Premier horses. The first race, open for class Copper horses, should start at 1.15pm.